Your gala might be a large event with an impressive auction catalog to match. But catalogs can be expensive to print. In fact, printing costs are one of the highest expenses when producing a fundraising auction. Anything we can do to reduce unnecessary printing is good for your bottom line and the environment. One of my clients was brilliant. She dropped her auction catalog production costs from $14,000 to $7900. Tabs are expensive. 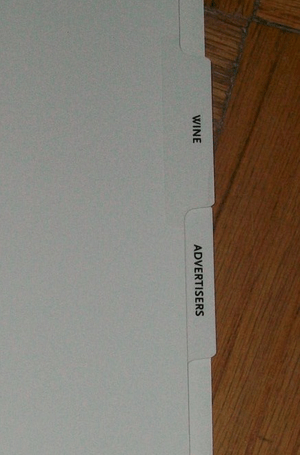 Although I think the tabs make it easier to find a particular section, I do not think they are worth the added expense. Have the printer show you some other options (heavier-weight paper) as an alternative. Be sure your text is large enough for someone over the age of 40 to read it, but you might be able to reduce the font size, change the font, or redesign graphics and margins in order to allow more text per page. Catalog font doesn’t need to be as large as the font often on auction websites, but it needs to be a comfortable reading size. To test the font size, have your committee read it. They are representative of your guest population and can judge whether the typefont will work for your group.